Open since 2003 and located in the heart of the Dallas Arts District, the Nasher Sculpture Center is home to one of the finest collections of modern and contemporary sculptures in the world, the Raymond and Patsy Nasher Collection, featuring more than 300 masterpieces by Calder, de Kooning, di Suvero, Giacometti, Hepworth, Kelly, Matisse, Miró, Moore, Picasso, Rodin, Serraand and more. The longtime dream of the late Raymond and Patsy Nasher, the museum was designed by world-renowned architect Renzo Piano in collaboration with landscape architect Peter Walker. 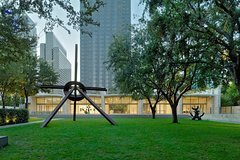 Welcome to the Nasher Sculpture Center – a museum oasis in the heart of downtown Dallas and home to one of the finest collections of modern and contemporary sculptures in the world. Explore the luminous indoor and outdoor galleries to discover works by the greatest artists of our times, including those by Matisse, Picasso and Giacometti, as well as to view special exhibitions featuring modern masters and contemporary artists. Complete your visit with lunch on the terrace at Nasher Cafe by Wolfgang Puck and be sure to stop by the award-winning Nasher Store for one-of-a-kind gifts, jewelry and décor.